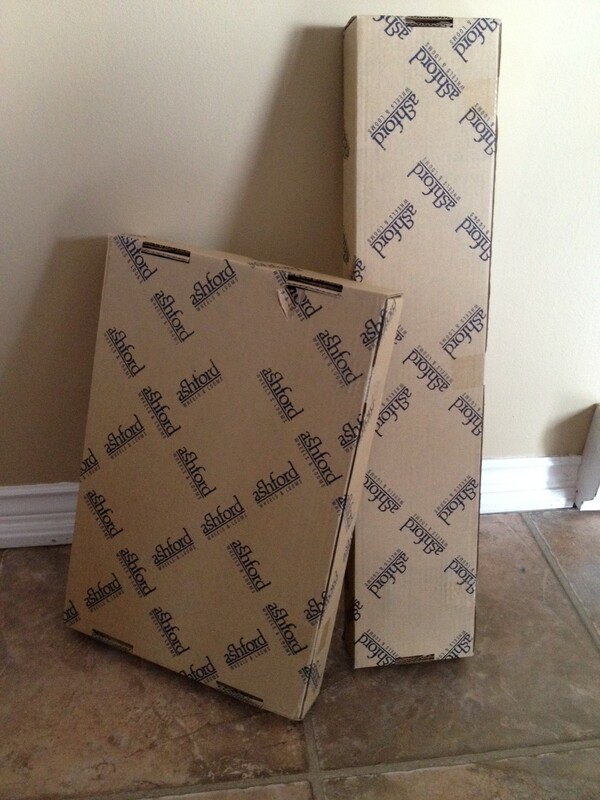 Two different people guessed what was in one of the two boxes. My mother in law had a bit of an advantage as she knew I was saving up money to buy something special. 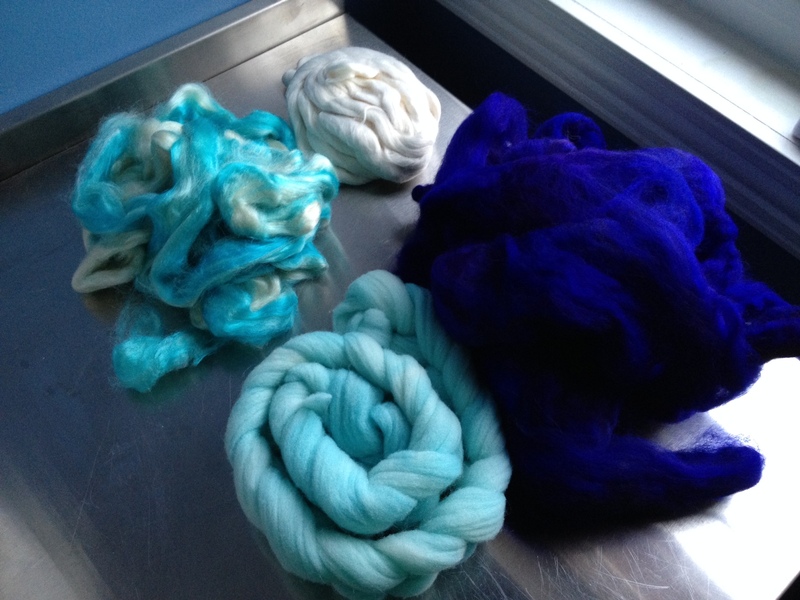 It’s something I had wanted for several months, ever since Shireen had started me dyeing my own fibres. I had been wanting to lay hands on a blending board ever since I realized that a drum carder was 1) expensive and 2) overkill for what I was trying to accomplish…unless First Light Handcrafts goes into the batt-making business. But I digress. 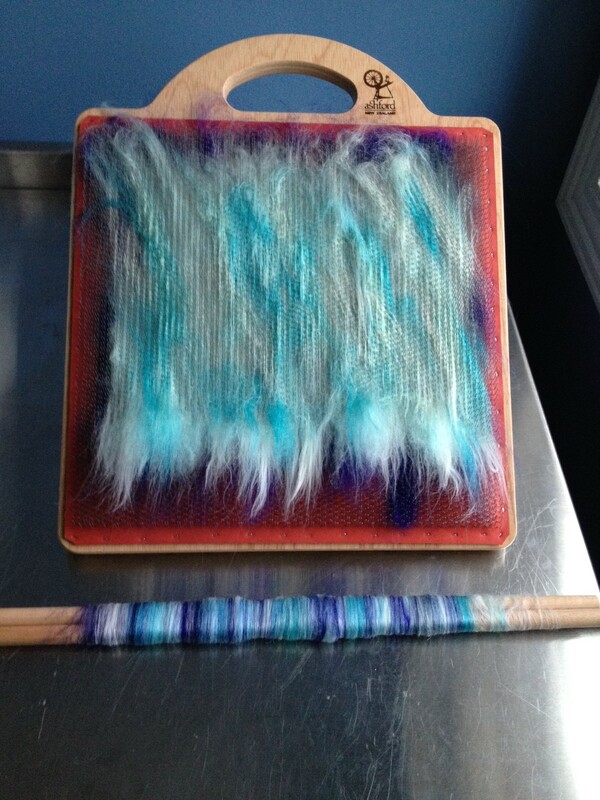 On Sunday, I set up the board and located some fibre that I had dyed while I was still living in Toronto….some unidentified Minnesota wool and some undyed Tussah silk, both dyed using turquoise dye. I also found some undyed bamboo. 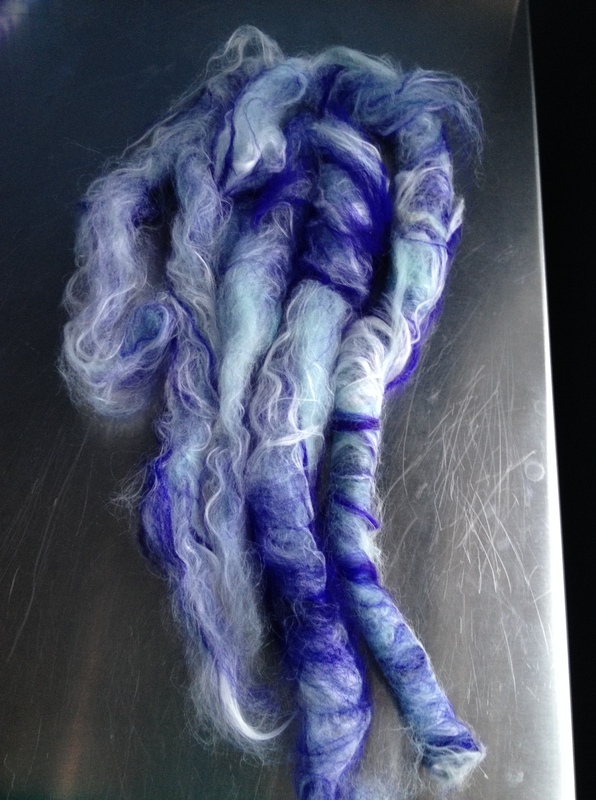 Using the purple BFL as a base, I started…a layer of it, one of the bamboo, one of the water-y blue and one of the blue silk. I then set to making my rolags. My first pass looked perfect…until I realized that I was never going to get the rolag off the dowels in one piece. The part of the instruction video that failed to stick in my head? The part where she made three or four rolags from one board full of fibre…not just one. Oops. The fibre was so tight I was totally unable to even budge the rolag. I had to tear it up to get it off. Back to the drawing board. Try number two went, I am happy to report, much better. I deliberately made 4 per board and got 8 rolags done before I decided I had some other fibre-y tasks to get to. I will be making a good many more of this colour set…I imagine until I run out of one of the components to make them. 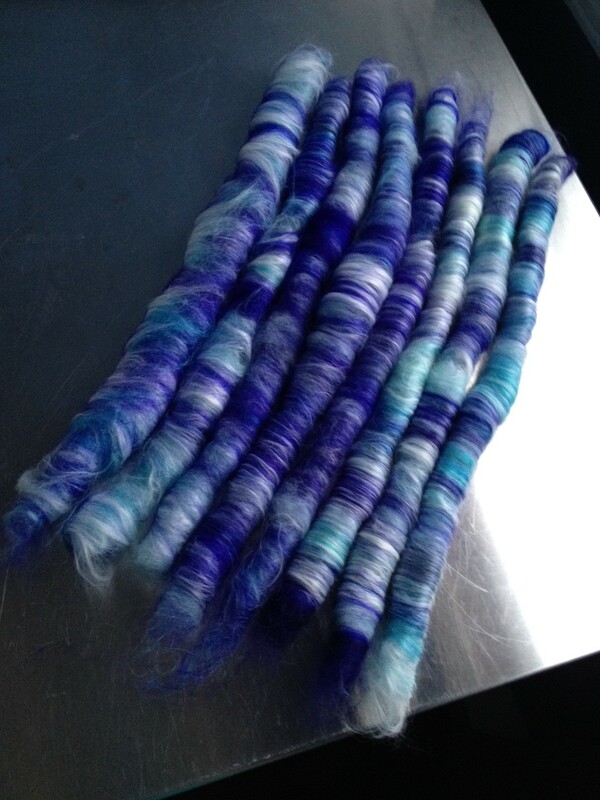 I almost want to free up a bobbin and start spinning…I am so excited to see how they spin up! That is very pretty. 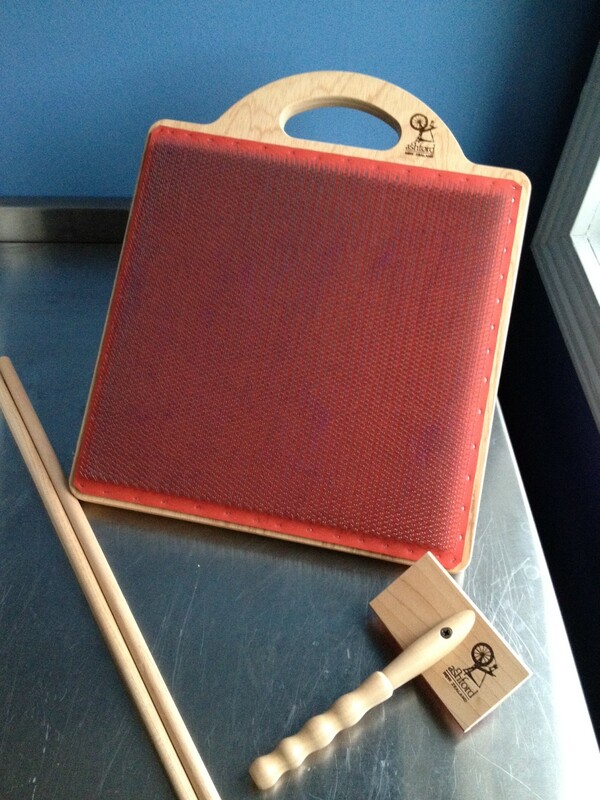 I have access to a (rental) drum carder, maybe I should play sometime! These are so beautiful! I can’t wait to see how they spin up either!